2010 began watching Sydney’s famed fireworkdisplay from a crowded viewpoint near Mrs. Macquarie’s Chair. Large crowds and the absence of friends meant it was somewhat anti-climatic, but I’m still glad to have experienced the event first-hand. 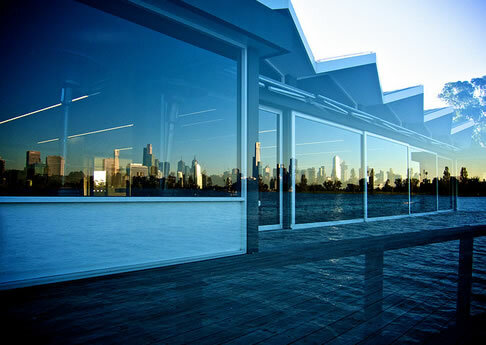 Reflection of Melbourne’s CBD in a window at Albert Park. I ended my three weeks down under in Melbourne. As the cultural capital of Australia, I happily spent half a day engrossing myself in the exhibits on display in the Olympic Museum at the National Museum of Sport. I could have spent the rest of the day there, but the rare opportunity to be given a tour of the city by friend and former colleague Phil McCluskey was too good to miss. If starting the year in my favourite country was a highlight, contracting a virus (possibly Swine Flu) on my return was easily the low point; it was quite possibly the sickest I’ve ever been. On television, I was enthralled by a new BBC Two series, Michael Portillo’s Great British Railway Journeys, which would provide inspiration for travel to come later in the year. When Clearleft won a project with BBC Radio 4, I jumped at the chance to be involved, and February began with a kick-off meeting at their offices within sight of Broadcasting House. A small project with many constraints, I still found it a fascinating—if at times frustrating—insight into how the organisation works. Everyone hard at work at Hack the Planet. 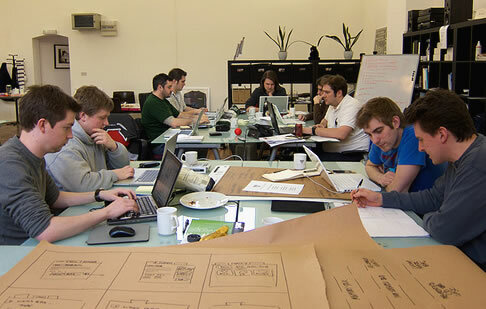 Much of February was taken up with the organisation of a hack day. Hack The Planet brought together a group of developers one Saturday in Birmingham with the aim of building something that might help people reduce their carbon footprint. Many ideas and concepts were generated, and although these never progressed beyond the prototype stage, the discussion around the issues was immensely valuable. February also saw a visit from my friend Simon, who I introduced to the many sights of Littlehampton and Brighton. This included a visit to the Brighton Pavilion, whose opulent rooms I know to be as awe inspiring as its decorative exterior. March was a sad month for Clearleft as it saw Nat leaving to get married, run a marathon, travel the world and start a business. Yet it also saw the start of our work with Channel 4 News; worth it alone to see Jon Snow in his native newsroom environment! In the run up to the general election, there was also much letter writing to avoid the passing of a rushed and flawed Digital Economy Bill. I’m going to stick my neck out and put my money on Vettel winning this years F1 World Championship—certainly a deserving winner if he does. 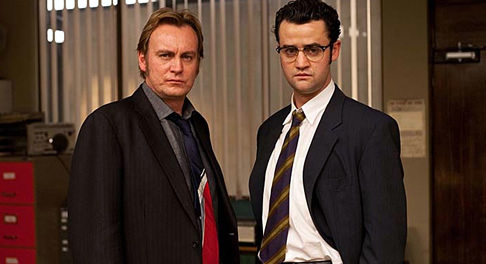 Gene Hunt and Jim Keats from the final series of Ashes to Ashes. April saw the concluding series of Ashes to Ashes, leading up to the reveal of who, or what, Gene Hunt really was in May. Its testament to the writing and excellent cast that the final episode has stayed with me since—possibly the finest ending to a drama series I’ve ever seen. If only the same could have been said for the Leaders debates, that was also essential viewing throughout the month. The Easter holiday gave me a chance to visit Arundel Castle. My typical malaise meant I arrived too late to see inside the Castle, but the gardens and surrounding grounds were beautiful. The new Wembley Stadium perfectly embodies the national game as it exists today: soulless, expensive and bland. Tickets to see Ricky Gervais live at Wembley Arena also meant I finally got to see the new Wembley Stadium up close for the first time, yet turned out to be just as underwhelming as Ricky’s show, which felt under prepared, lacking structure, and missing much of the humour of his previous tours. Much of May was spent in London, be it meetings at Channel 4’s offices in Westminster or attending UX London near Marble Arch, and this inspired me to see more of the city. So on the Sunday after UX London I became a tourist and walked around Westminster and the City, a perfect opportunity to see the Lloyd’s building and Gherkin at close quarters. With Dave Gray, one of UX London’s speakers staying in the UK after the conference, Clearleft asked if he would give us a two day intensive sketching workshop. Starting with basic drawing techniques and finishing up with fun collaborative exercises, meant I came away with lots of useful tips, and a renewed desire to sketch more often. 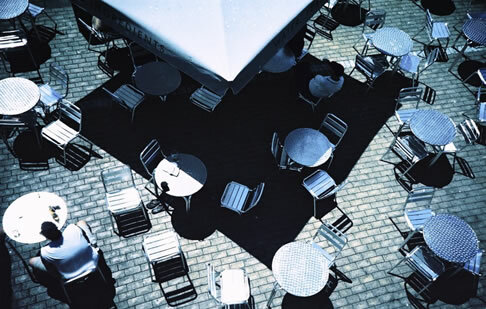 My favourite photo taken during Lomo Workshop. One weekend in June saw the entire web development community descend on Brighton to celebrate Nat and Simon’s wedding, which was notable if only for the wildlife on display. Later in the month Clearleft had another creative day out, this time learning the techniques of Lomography with Lomo Kev. And what better way for Shannon, Clearleft’s summer intern, to spend her first day! After 6 months spent looking for a flat in Brighton, I finally found one I could see myself living in; located near Preston Park, it would mean a 30 minute walk in to work everyday, so also had added health benefits! It wouldn’t be available until August, but I saw this as a good thing as it gave me plenty of time to prepare. Around the campfire on Jon’s Gower stag weekend. With Jon’s wedding fast approaching, so a stag weekend on the Welsh Gower peninsular was enjoyed by all except the perspective groom. 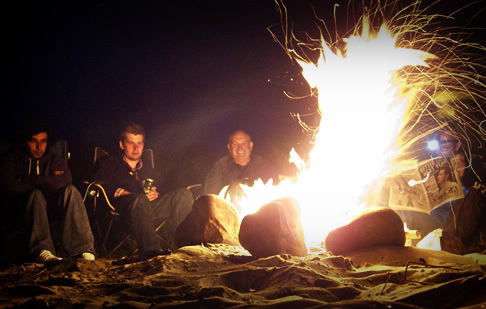 Jon survived relatively unscathed; indeed spending the last evening around a campfire in the secluded dunes was especially memorable. July also saw the launch of a redesigned BBC News website, alongside the public release of the GEL guidelines. This is a project I’ve become increasingly interested in, and led to the creation gelled.info, a sort of GEL trainspotters guide. I started this month not knowing whether I was coming or going. Moving into my new flat, followed by a weekend in Wales and then a holiday in Scotland meant I was often finding it difficult to keep up with myself. The annual weekend in Wales felt a bit strange this year as we could no longer use the same field in Dollgeau we had camped on for the last seven years. Marred by bad weather and the new surroundings, I have mixed feelings as to whether the tradition should continue, but I’m prepared to give it another go this year just to be sure. Having decided earlier in the year that I wasn’t going to fly, my holiday was always going involve travelling somewhere by train. 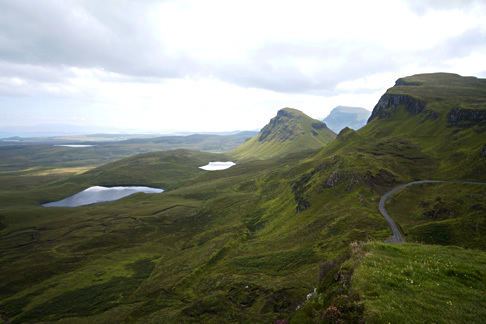 After briefly considering a trip around northern Europe, I instead opted for a tour of Scotland, taking in the Isle of Skye, the Highlands and ending with four days in Edinburgh where I enjoyed its many sights by day and the Fringe Festival by night. The whole trip was magical and a useful reminder that you don’t need to travel halfway round the world to find great scenery, culture and entertainment. August ended with the marriage of Jon and Katie. Knowing both the bride and groom, and many of their friends and family meant the day was especially enjoyable, also helped by the fantastic venue for the reception. As ever, September kicked off with dConstruct, and this was widely regarded as the best edition of the conference yet. Whilst the star attraction for most was Merlin Mann and John Gruber, James Bridle stole the show with his tribute to Geocities and the unveiling of his Iraq War Wikipedia Historiography project. Thanks to Clearleft’s work on the Radio 4 site earlier in the year, me and Andy were invited to a night at the Proms—a first for me, although it may have been more enjoyable had I remembered my glasses! 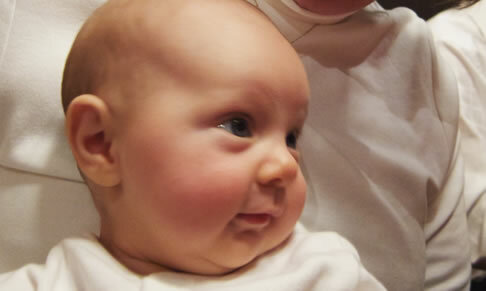 However September will forever be marked for another reason, as I became an Uncle for the first time. My brother and wife had their first child, Maria; it’s going to be fascinating watching her grow over the coming years, and it’s certainly given me a new perspective on the world. October was a fairly quite month. Had I not seen many of the shows in Edinburgh, I would have made more of the Brighton Comedy Festival. A company night out took in the ‘Best of the Fest’, which was a mixed bag of comedians I’d already seen, wouldn’t want to see again, and one who was excruciatingly bad that it was fun to watch anyway. I also went to see Jimmy Carr, whose show was hilarious to start with, but became tiresome by the second act, although not helped by a persistent heckler. November saw me attend my niece’s Christening, a bittersweet affair knowing my brother’s family would be leaving for a new life in Brazil soon after. I also attended Build Conference, an event that has quickly earned a reputation for both its speakers and the surrounding fringe events. I left with plenty of ideas on how Clearleft can improve our own conferences, yet also mindful that Build could take lessons from our own events too. 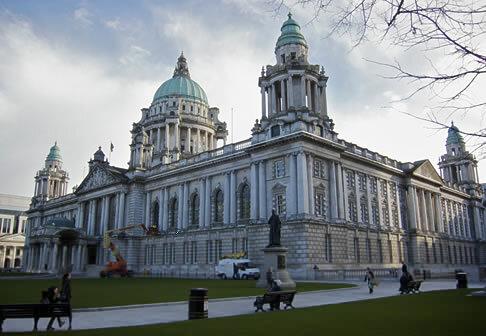 I was surprised by just how much I enjoyed Belfast, and was glad I could grab lunch with an old friend form Uni whilst I was there too. Given that it was a 17 hour long train ride to Northern Ireland, I wanted to make sure I spent a few days in Dublin on the way back. I was pre-warned that the city was neither interesting or that representative of Ireland, and I think that was proven. The only Multipack Presents event 2010, saw me give a presentation for the first time about styleguides, GEL and the design process. Whilst it was well received, I know I have a long way to go before I can be considered an accomplished speaker. There’s lots to learn, yet it seems I have a sudden urge to do just that. November also saw the launch of a redesigned Fontdeck, something I’d been increasingly involved with as part of a small sub-team within Clearleft. I’m not sure I ever want to move exclusively to product design (been there, done that), but I love having the opportunity to do so alongside traditional agency work. Inspired by the baking exploits of my colleagues, I had my first go at baking bread, with reasonable results. Baking turned out to be immensely satisfying, so I’m sure I’ll be doing more of it over the coming months. With my brother in Brazil, Christmas was a quiet and relatively stress free affair, allowing me to lay the foundations of a redesign for this website. I ended the year at the Village Hotel in Walsall. Whilst not as glamourous compared to how the year started, I was thankful that I could see in 2011 with friends, yet at the same time was reminded by how much my life has changed in the last few years, my week at home feeling very much like a step into the past. Before such a post becomes embarrassingly late (although I fear we may already have passed such a point) here is a quick run down of what I got up to last year. 2007 started with me looking forwards rather than backwards, and with a view not only to take opportunities that came my way, but make my own as well.